As one of the most preferred online bookmakers amongst nations throughout Eastern Europe FavBet continually works towards delivering the maximum level of convenience to all its members. As such, the brand developed an Android specific mobile app to provide the ultimate user experience for all players and punters preferring to spend their gaming and sportsbook sessions on an Android mobile device. Installing the FAVBET mobile app for Android will allow you to enjoy several fantastic features including the capacity to stream matches in full-screen and place quick bets. The full range of depositing and withdrawal options, quick event searches will allow you to check out the latest results and schedules of all upcoming sporting events. To download and install the required software, please follow our guide detailed below. To start the download process, navigate to the FavBet Android app download page, then select the large grey “Download” button to initiate the process. The Android APK installation file will then automatically download and complete the installation. Upon completion, you need to sign in using your existing username and password to remain seamlessly connected across all your devices. Is there iOS .app for download? FAVBET continually endeavours to best cater to the needs of all its members, however, due to the relatively modest number of iPhone users amongst its members in Eastern Europe the company did not develop a dedicated iOS application. Users preferring the iOS software environment still can access FavBet’s excellent cross-platform compatible mobile version/mobile portal and receive the same brilliant sportsbook user experience they would expect on other devices. To access FavBet’s sportsbook, casino, or other entertainment sections via iPad or iPhone and still receive the full, rich user experience, users need to open their preferred mobile browser and navigate to the FavBet mobile site. The bookmaker’s cross-platform compatible mobile portal/version provides access to all mobile devices via an interface fully optimised to suit mobile touchscreens on tablets and smartphones. Using FavBet’s mobile version/portal for Android offers users with some highly convenient features which embeds it with that extra level of convenience. The options include the capacity to stream matches in full-screen, place quick bets, depositing and withdrawal options and quick event searches. The ability to check out the latest results and schedules of all upcoming sporting events is also featured. Active FavBet members accessing the brand’s online sportsbook via its dedicated Android mobile app will find a highly user-friendly interface that offers them the capacity to enjoy their sportsbook and casino activities fully with all settings, personalisation features, betting options, and other functions still available to them, seamlessly without the need to revert to a desktop PC. That provides punters with the level of flexibility they would only receive in a customer focused, high-end online gambling entertainment venue. FavBet’s ability to provide a notably extensive range of live sports markets and a remarkably large number of betting options quickly turned it into a firm favourite amongst its members mainly centred in and around Eastern European countries. With a sport as its core business, the brand features all the regular betting options but also offers an extensive number of Handicaps and Alternative totals. The bookmaker offers over 10,000 live events monthly and simultaneously offers punters high levels of flexibility to their mobile betting with features like the “Speed-Bet” option. That provides the capacity to quickly place in-play bets for the entire duration of a live event and includes many automation options that make using the Speed-Bet feature during live events even more comfortable and faster. Both the mobile portal and dedicated Android app offer punters the capacity to strategically Cash out and sell their bet slips back to the company at opportune times keeping them in full control of the success levels of their bet outcomes. The Cash out option offers punters the highest levels of flexibility they could desire during the fast-paced betting action submitted by live in-play bets. FavBet’s live streaming option called FAVBET TV certainly presents one of the best products of its kind and everything any punter could wish for to complete his in-play betting entertainment. With its comprehensive coverage of live sports events, FAVBET TV provides real-time live streaming access to its live in-play sporting events for all of its members in Kazakhstan, Georgia, Azerbaijan, Russia, Armenia, Ukraine, and Belarus. Primarily an online sportsbook FavBet features a full number of sports markets including all internationally favoured sports events and fixtures. The brand fully involved in the sponsorship of local as well as Croatian football teams and fixtures also offers a highly attractive international and European football product. Punters will find certain football matches could provide up to 200 betting selections that are further bolstered by additional betting options including Team to Win To Nil and Team to Score In Both Halves. Remarkably, its casino division features a wide variety of entertainment options comprehensively covering the complete spectrum of online casino entertainment options. With a massive range of slots as its principal component to instantly impress players, its traditional casino table gaming variety and other gambling types appear equally entertaining. Punters on mobile still enjoy access to the full comprehensive range of sports markets and betting options available on the desktop via the full website version. Finding and selecting sports events, placing bets, and custom features provide a hard to equal sports betting experience on mobile. With its sportsbook at the heart of its activities, the bookmaker delivers access to 31 individual betting markets including niche betting options that include Biathlon events and Badminton matches. That is in addition to its comprehensive coverage of globally favoured international sports types such as Basketball, football, and rugby. FavBet’s live betting selection similarly provides an excellent range of betting options covering an exciting array of events and fixtures with betting made extremely convenient by the semi-automated Speed-Bet feature. 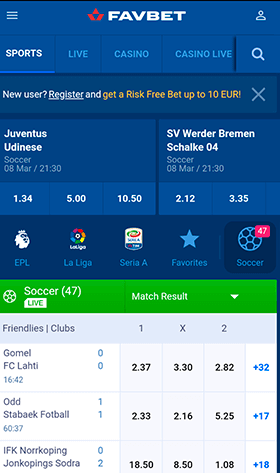 The feature offers punters the capacity to quickly place a variety of quick bets for the entire duration of matches and events according to specific personally selected and stipulated predetermined criteria. This feature is purposely designed to heighten the excitement of the live betting experience further. FavBet’s mobile casino app, as well as its mobile portal, offers players comprehensive access to all HTML5 platformed games in its massively entertaining casino lounge for an unparalleled casino player experience. The range and title selection incorporate many all-time favourites as well as many of the latest creations from some of the leading iGaming software developers in the industry. The list of software providers includes luminary brands such as NetEnt, Microgaming, BetSoft, Habanero, EGT, Endorphina, Amatic, and EGT. The list of highly-popular classics includes Gonzo’s Quest, Immortal Romance, Starburst, and Asgardian Stones with hundreds of others to complete your casino slots fantasy list. All titles and gaming types in its extensive gaming library come pre-sorted in convenient categories to make finding and playing any preferred claim a quickly accomplished breeze. The addition of a Live casino quickly became the showpiece of all top-grade online casinos by offering an amazingly immersive casino player experience. At Favbet, it is one where players freely socialise with like-minded individuals communicating between themselves as well as with the live dealers. FavBet’s mobile portal and app offer players the capacity to seamlessly move between mobile and desktop to continue to play uninterrupted on games of the highest quality. The mobile live dealer gaming library incorporates the same high-grade entertainment as found on its desktop version with offered gaming types that include a comprehensive variety of Baccarat, Blackjack, Roulette, and Casino Hold’em. The live dealer section offers an excellent, impressive range of live gaming variants. These include Speed Auto Roulette, Lightning Roulette, Immersive Roulette, Blackjack Party, and Top Card to name just a few. Currently, in contrast to the past where mobile users and casinos were entirely dependent on dedicated mobile apps to provide access to their favourite mobile online sportsbook or casino, latter-day HTML5 based mobile portals/versions provides fully cross-platform compatibility to all devices. To access modern HTML5 based casino or sportsbook platforms requires members to obtain a fully updated mobile browser. The most popular of which would be any of the numerous chromium-based browses such as Firefox, Opera, Chrome, and innumerable others. That opened up the field to provide a fully comprehensive, fully functional, familiar looking interface to all users irrespective of their preferred mobile brand. Despite the distinct advantages offered by HTML5 technology many still argue for all the benefits provided by a dedicated mobile app. Below we highlight some of the differences between the two systems and highlight the pros and cons of each. Samsung – Galaxy S6, S7, S8, S9, S10, Note 4, 5, 6, 7, 8, and 9, as well as the brand’s entry-level smartphone range and tablets. The bookmaker offers no mobile specific bonus range, but in keeping with the trend amongst modern online sportsbooks provide mobile users access to the full range of promotional bonuses and special offers found on its comprehensive website. This trend has become a commonality between modern HTML5 based online gambling entertainment sites and mobile users who do not need dedicated mobile apps aimed at providing mobile access to users. FAVBET as a successful online gambling operator adds to its international appeal with the inclusion of numerous popular banking methods. The aim is to provide a convenient range of finance methods to all its members irrespective of their location whether at home, the office, or on the go. Our table below highlights the most convenient internationally recognised mobile banking options. If I access FavBet using my mobile for the first time must I register for a second player account? No, you must use your pre-existing username and password. Any individual found having opened more than one player account will have both accounts locked without any prior notice. Regulations stipulate that owning a secondary sportsbook or casino account contravenes both local and international anti-money laundering and fraud laws. Are there any risks I may incur if I download and install software that is not from the Google Play Store? The Favbet Android app is currently not available on the Google Play Store. However, for additional peace of mind, FavBet’s complete website undergoes regular testing and certification procedures to ensure its total safety and security. That means you run no risk when you download the Android .apk. Why does FAVBET not accept players from the USA? I often travel to Romania for work purposes can I join and play? No, it is partly a licensing issue! Since its earliest existence, Favbet as a company maintained an impeccable reputation both legally and morally. As such, the company has always refrained from presenting its services in any area or region wherein it is not licensed or the laws governing authorising came under review with the potential to change extensively. Moreover, you will need to supply documentary evidence of your registered address where you currently reside. I live in Romania and love what I see on the mobile site; how old must I be to legally register and join FAVBET as a member? As a legally and morally responsible company, the brand does not accept players before they have legally celebrated their 18th birthday. If I want to play using my mobile phone while on public transport on my daily way to work must I make another deposit purely for funding my mobile account? No, to use your mobile device for accessing your FavBet casino player or sportsbook account you must log in using your existing username and password. That will seamlessly load all the benefits and funds you enjoy via your desktop. I no longer own a PC and want to use my Windows platformed mobile phone to access my casino account. Can I do so and will it be compatible? Yes, with the understanding that you utilise one of the modern chromium based mobile browsers on your Windows phone when accessing your FAVBET account. Using my mobile, can I register to open an account with Favbet? Yes, you certainly can, using both the brand’s dedicated Android app as well as its mobile portal/version will provide you with full functionality over all the standard features usually found on its comprehensive website. Initially established in Ukraine, but currently registered to offices in the capital of Curaçao the company maintained its focus on continually improving its product across all verticals to provide members from across the globe with the most amazing online sportsbook and casino option. Owned and operated by Favorit United N.V. a company licensed by the government of Curaçao to legally conduct its international online and land-based gambling operations. The brand reportedly has garnered the interest of over 600,000 of its members from across the globe. It has, over the past 15 years, gained a tremendous amount of experience which it put to good use to improving its relationship with its members and increasing its appeal in the highly competitive international online sportsbook market via an excellent betting product as well as a website of equally matched quality. The brand ploughs of its earnings back into maintaining and increasing the appeal of local sports via some sponsorship deal with both local and Croatian teams. After our unbiased assessment of FavBet’s mobile offering, both in terms of features, quality, flexibility, and ease of use, we had to admit the range of available sports markets and betting options came as a pleasant surprise. We were even further impressed with the pleasingly polished look and feel of the mobile software and the flexibility it afforded via its numerous custom and unique, innovative features such as the Speed-Bet option. Moreover, its mobile products provided equally good levels of day-to-day performance. It offered easy navigation, clear, easy to read uncluttered menus and an interface combined with a full range of user-friendly features. That made it a great companion for online entertainment while travelling. It is considering all the many positives offered by the brand. Its only let-down is the current lack of availability in countries located throughout Western Europe and most of the rest of the world. As such, we rate its excellent mobile product a 9/10.